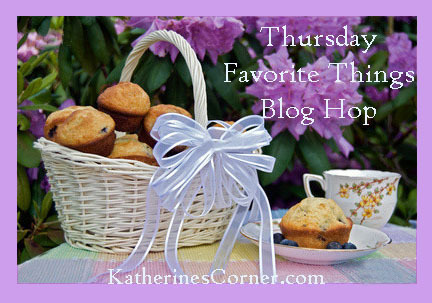 I’m really excited to be co-hosting the Thursday Favorite Things Hop this week. It’s a fun hop I’ve been participating in for a couple months, meeting new friends, and getting lots of creative ideas. There’s always something new to discover at Katherine’s Corner, good food, good people, creativity; what more could you want? Please join us this week! Thursdays Favorite Things Hop is where you can link your favorite post to share with old and new followers, or write a post about your favorite things! Leave a sincere comment when you follow so we all know you stopped by. Follow as many other blogs in the list as you can. Just click and go. Please grab the hop button to share with others, you can copy and paste the image with a link to KatherinesCorner.com OR grab the code from Katherines Corner it’s on her right sidebar. It’s always nice to have the hop button on your post. But it IS NOT mandatory. Thanks for stopping by & following. I’ll be visiting you again soon, this week was just too busy. Congratulations on being co-host of the Thursday Favourite Things Blog Hop. I am a new Follower of your Blog. Have a good day. I am hopping over from Katherines Corner and love your blog! I can’t wait to read more! Congratulations on co-hosting Katherines Thursday Favorite Things Hop! Ive been a follower on Katherines blog for a while now, and I love it! and Im your newest follower!